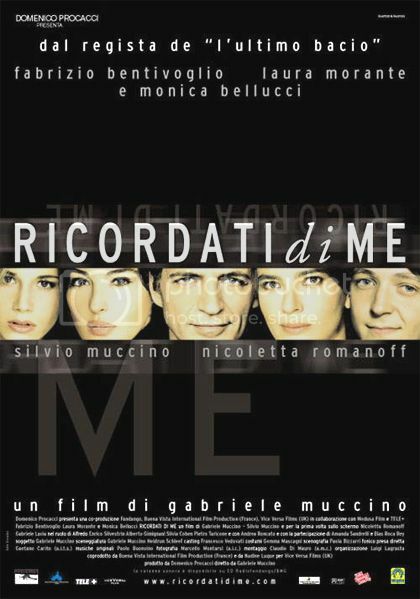 With the allegretto pacing, semi-satirical tone and superficial beauty that is characteristic of all of director Gabriele Muccino's films, Ricordati di me (Don't forget about me, though the US title was Remember Me, My Love) explores and generally eviscerates the modern Roman yuppie. The family of characters in Ricordati di me run the gamut between limp lettuces and egotistical jerks. Must be hereditary! Parents Carlo (Fabrizio Bentivoglio) and Giulia (Laura Morante) are suffering from the usual cinematic marital ennui. Their teenage children, the insecure Paolo (Silvio Muccino, the director's younger brother) and the predatory Valentina (Nicoletta Romanoff), are in the same predicament, restless and unsatisfied. All four seek external validation and gratification. All four repeatedly seek confirmation that they are still attractive in the eyes of "those outside". Indeed, solipsism and selfishness run deep in this family. And each cultivates a private ego project: Paolo via an affair with an old flame (Monica Bellucci), Giulia by dusting off her amateur acting career, Paolo via an old crush on the shrewd Ilaria (Giulia Michelini), and - most troublingly - Valentina by becoming one of those awful TV starlets on Italian variety shows (if you're not familiar with these girls, BE GRATEFUL). As in Muccino's other work, this film is fundamentally a satire of these people, even if it flirts with sympathy for them. But these are the most unlikable of Muccino characters - worse than the philandering 20somethings in L'ultimo bacio or the superficial rebels with adopted causes in Come te nessuno mai - mostly because these are yuppier, superficialer and pettier than all those other people. They're also living in an apathetic, post-political vacuum - something the film hints at by indicating, ever so briefly, at the Fascist heritage of the yuppies' neighborhood and the right-wing whitewashing of the Italian political landscape. These aren't the politicized, concerned citizens of C'eravamo tanto amati or Love and Anarchy; instead, they are as complacent as they are self-centered. There's better versions of all these things: Signore e signori was a more cutting and more satisfying portrayal of bourgeois moral corruption; Revolutionary Road a better portrayal of a dissolving marriage; and Come te nessuno mai a more fun Muccino film. Plus, this film suffered from vague misogyny in portraying the women as either spineless lumps or sluts: then again, we couldn't tell if the cynicism of Valentina's Becky Sharp storyline or the eventual triumph of limp dishrag/sobbing mother into self-assured theater artiste were subverting the misogyny or condoning it. The performances were notable, if only because they were all pretty likable or impressive, despite the horribleness of their characters and the meh-ness of the plot. Nicoletta Romanoff was phenomenal as the femmbot from the abyss, Silvio Muccino was his usual laconic slacker, Laura Morante was a pack of nervous energy (in great contrast to her usual roles), and Fabrizio Bentivoglio is our great discovery as the man born to play Lorenzo il Magnifico! Someone get that man a doublet!